From our point of view the earth appears to be surrounded by a great celestial sphere upon which the fixed stars are attached. This celestial sphere slowly rotates upon its axis, making one complete revolution per day. 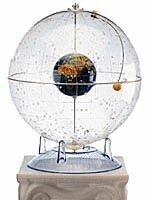 During the night we see the stars affixed to this sphere slowly rise in the east, travel overhead, and set in the west. If we look northward we see the stars rotate around the north celestial axis. Currently the star Polaris, also known as the North Star, is very close to the north celestial axis. If you can find the North Star you then know which way North is. More importantly, the angle between the horizon and the North Star tells you what latitude on earth you're at. This helps ships navigate the open ocean. 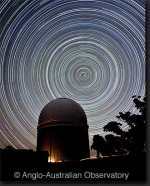 2000 years ago Polaris was not near the north celestial pole due to the Earth's Precession. Also present against the celestial sphere is the sun. In the picture of the celestial sphere model above the sun can be seen to the right of the earth and just slightly below the equator. The sun's position on the celestial sphere changes during the year, which is why the sun is on a swivel arm. We will talk more about the sun's annual journey around the celestial sphere later. Philosophers have pondered for eons about what this great celestial sphere was made of. It was apparently made of some heavenly material we could not fathom. There was also the unexplained problem of five wandering stars known as "planets." Eventually the concept was abandoned when scientists decided it was the earth that was rotating on it's axis instead of a great celestial sphere rotating around the earth. The Foucault Pendulum is a very simple yet profound demonstration of the earth's rotation. Even though scientists have abandoned the Celestial Sphere theory, notwithstanding the objections of the Catholic Church, it is still convenient to use a celestial sphere as a map of where the stars and constellations are.